Summer is the perfect time to break out the Polaroid camera which is exactly what I have done. My Polaroid has gone everywhere with me this summer and I love taking pictures with it. By this point in the summer I have gone through numerous boxes of film and now the pictures are starting to pile up on my desk. I came up with a few ways to store/ display them so they aren't just laying around. 1. Use them as book marks// As someone who loves to read this was the first thing I thought of. I think it is so cute to use a picture as your book mark because every time you open your book there's a cute picture! 2. Hang them on your wall// I have seen so many cute ideas on Pinterest for how to display pictures on your wall and they sell displays for them too. I used a magnet board I got at either Kirkland's or Home Goods and I think its so cute! 3. Make a scrapbook// McCray and I decided this summer we would create a Polaroid scrapbook of our summer together and so far it is looking so cute! Scrapbooking is a great way to display your Polaroids because its something you can look back on when you're older and they are so much fun to make. 4. Put them in your phone case// I got this idea from McCray. If you have a clear phone case you can put your favorite Polaroid in there. McCray switches her pictures out depending on the season so right now there is a cute picture from one of her summer adventures and in the fall she puts a pumpkin patch pictures in there. 5. 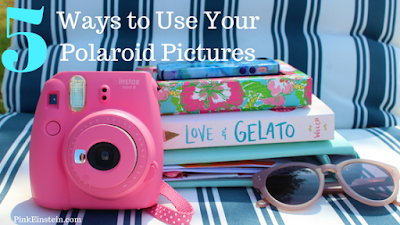 Store them in a picture box// I know the point of this post was to share ways you can display your Polaroids and this tip is just putting them in a box but I actually really like this idea. This is another idea I got from McCray. When I was at her house I was looking through her Polaroid box and it was so fun! It was a collection of memories from middle school up until now and she was telling me the story behind each one as I was looking through them. You can put your pictures in a cute box and set them out on your desk or your coffee table where you and your friends have access to look through them when ever you want. I never thought of using Polaroids as bookmarks. That's such a genius idea!